The fact that chess is a sport that requires knowledgeable spectators has been an obstacle for the royal game in the past. This situation is rapidly changing, with the entry of internet and different broadcasting methods the game is constantly increasing its audience. Adding the celebrity status of the world N1 rated player Magnus Carlsen, and the recurring success of the World Champion since 2007 Vishwanathan Anand, bring the potential of the World Chess Championship 2013 to new heights. Only eight days remain to the start of Anand – Carlsen 2013, it is time for the coverage preview. Note: All the action of Carlsen – Anand 2013 will be live daily on Chessdom with computer analysis and commentary by IM Aman Hambleton, IM Tania Sachdev, and GM Vidit Gujrathi (more on the team later). Viswanathan Anand is a national hero for the second most populated country in the world. Being undisputed champion since 2007, he has inspired generations of young players to enter the sport. Now, aiming for yet another World Championship title, Anand will be doing it in his home town, Chennai. The expectations in India are at maximum, everyone wants to see his hero competing against the current world star Magnus Carlsen. That is why every major news channel, newspaper, and media source in India is blasting news on the upcoming World Chess Championsip. The biggest sports channel of DD Sports has started with a few preludes to the match and seeing the interest has decided to acquire the global TV rights of the event. It has a reach of over 100 million people and its free-to-air satellite signal can be seen across large part of Asia and some locations in Europe. Some newspapers are looking for the sensation or to add to the hype and sometimes commit factual and historical mistakes, but that is very normal in any large sports event in the world and is mainly due to the desire to bring the most interesting reports about the match. Norwegian media are used to covering the success of Magnus Carlsen in the past years. They know his celebrity status quickly generates large viewership and readership both in Scandinavia and around the world. Therefore, the young Norwegian often hits the main pages of mainstream media and baths in the awe of his fans. As a general rule, all country resources aim for Carlsen camp news in the days before the competition. The visit of Magnus to Chennai was largely covered by local media, as well as the stories about Carlsen bringing his own chef to India. 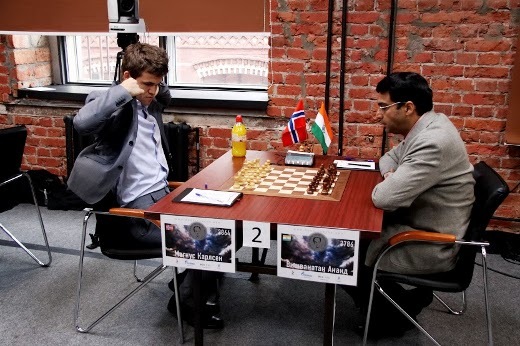 No self respecting sports edition will miss the Anand – Carlsen 2013 clash. News about the upcoming encounter are to be found in (at least) 55 countries so far. Guardian, The Economist, Zeit, Marca, NY Times, Washington Times, The Asian Age, Zee News, The Independent, Business Standard, BusinessWorld, Telegraph, Prensa Latina, El Pais, etc. all have had their previews of the match. Asia news hype on the success of Anand and his reign since 2007.They tend to underline the historic praise that Anand has gotten so far, and the chance to reach the status of “greatest in modern chess history” with a victory in Chennai. Interestingly, the articles often contain bits of information about local heroes and their view on the upcoming match. The growth of chess around Asia is also a recurring topic, viewing the massive and growing as popularity competitions organized on the continent. Western agencies tend to focus more on Carlsen’s persona, his quick rise to the top and his active roles outside the chessboard. The Guardian interviewed the Norwegian and mentioned more than once the fact that he makes a good salary with his profession: “Unusually for a chess player he makes more than £1m a year in sponsorship, and he doesn’t seem to mind performing stunts as part of his contractual obligations, such as the blindfold simultaneous games”. A very important observation of an ongoing process – nowadays hundreds of chess players are making a living out of chess, the professional calendar of FIDE is full to the maximum with well paid competitions, we often see players complaining about not getting rest, and the financial stability of the World Championship backed with 2,55M guaranteed prize fund. Being a chess player has changed radically in the past few years and suddenly has become a financially attractive profession. The Guardian also made the logical comparison between Magnus Carlsen and Bobby Fischer, as they both reached the very top despite not belonging to a chess-oriented country. 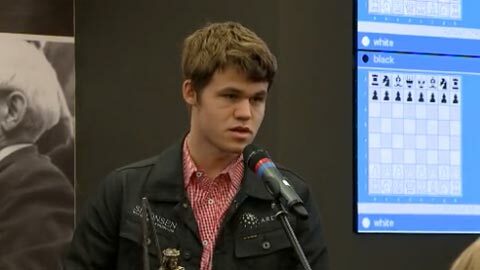 When asked about this, Carlsen shows his good sense of humor: “I’m only 22, so there is still plenty of time for the crazy”.